Loved this episode! 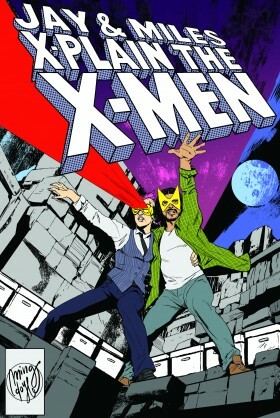 I jumped on board X-Men pretty recently and haven’t gotten around to all the old stuff so this podcast is wonderful. THANKS, RACHEL AND MILES. that said, allow me a moment of pedantry and suffering. You had a listener ask why Magneto is depowered along with the rest of the Phoenix Five post-AvX, and your explanation makes SENSE. It’s a good explanation. It’s the explanation the story was hinting at all along. It makes sense! So, spoilers for Bendis’ current run of Uncanny X-Men/All New X-Men. In issue #22 of Uncanny, it turns out that, uh, Dark Beast (!) injected the Phoenix Five + Magneto with nano-sentinels, which no one noticed before then, and those nano-sentinels were what was ruining their powers. Nothing to do with the Phoenix Force at all. That said, I like your explanation better, so I’m just going to pretend that’s what it really was. Thanks for the podcast, and keep up the good work! Was I the only one disappointed that Dark Beast ended up being the mastermind behind that whole arc? I was really hoping for an actual betrayal from within (or at least the shocking return of a long forgotten villain). Wait, were those nano-sentinels responsible for ALL the problems they’ve been having with their powers since AvX? I thought they were just the cause of Cyclops and Magik freaking out at the Jean Grey school. Yeah, you’re totally right (although Bendis has yet to adequately explain just how or when that happened). It’s a single line in a single panel that connects the nanosentinels to Scott’s (and by extension, the other affected mutants’) loss of power control, but it’s there. I thought they said something at some point about Magneto’s powers malfunctioning because of the way he got them back from the High Evolutionary after M-Day as well. I thought they made some reference to his powers being unstable because of that. I could be making that up though. Love the podcast. I’m old enough that I was buying the Dark Phoenix issues as they were coming out. I remember being really impressed that Kitty was only a little older than me. I’m not sure how old she’s supposed to be now, but I’m pretty confident I’m old enough to be her father. Great panel choice to demonstrate the disco. I remember reading an interview with Byrne where he said he had hoped that panel would be colored so that everybody had white skin and green hair. The guy on the left in the foreground is the Joker. You need to look up some pictures of Peter Wyngarde as “Jason King”. It’s a little scary just how good a job John Byrne did…. I remember leafing through “digital back issues” of this part of the run forever ago – back when I was in high school, and the internet was still a dangerous and wild place, filled with Geocities and Webrings. And now I’m going to have to read it all again. Admittedly, I’m actually slowly reading through the Silver Age content right now (which is stuff I’ve never gotten around to reading before) alongside the entire run of Spider-Man, but I’m just going to have to read as much of the X-Men that I can muster. Thanks so much for making the X-Men sound way more awesome than they are at their worst, and showing off the X-Men at their best by making the awesome still sound awesome. For future listeners less familiar with the play, it’s from Henry V, the “once more into the breach” speech where Henry is psyching up his troops before the battle of Harfleur, and I thought it was really interesting because I can’t tell how much the parallel is intentional. Henry’s a young and inexperienced king, (and the French have been mocking him over his reputation for goofing off) and this is the first battle in basically the first major event of his reign, so I could see Wyngarde comparing Cyclops to Henry out of contempt. But on the other hand, Henry winds up with a spectacular victory at the end of the play (and an explicitly miraculous lack of English casualties), so that would be a little odd for Mastermind to be calling up that parallel at a point where he’s sure he’s won… but it *totally* fits if that’s the writers making that connection in the larger context.